When I was a pregnant with my first and shopping like crazy for anything baby-related, my own mom told me that her all-time favorite brand of toys was Fisher-Price. Once I started looking at the toys and gear with a mother's eye, I understood why Fisher-Price was a standout among so many other brands. After all, we know that Fisher-Price is time-tested when it comes to the best baby toys, and toys for toddlers and bigger kids are just as popular and loved by kids and parents. When it comes to toys, parents simply know and trust Fisher-Price for great products that combine fun with learning. Right now, you can save instantly on seventeen of the most popular Fisher-Price toys from the Laugh n' Learn, Little People and Imaginext brands! 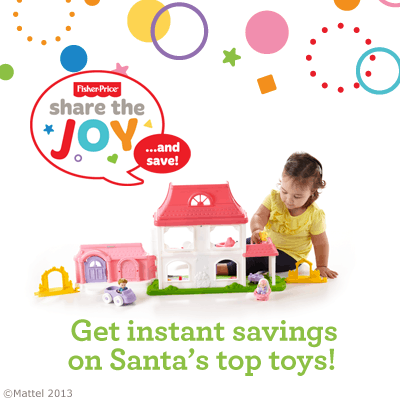 Visit the new Walmart.com Share the Joy page to browse the featured items and enjoy instant savings (while supplies last!). The holiday season will be here before you know it, and Walmart is spreading the joy of learning through the shopping season! From infants to pre-schoolers, Fisher-Price has the perfect gift for all ages at prices that will make you want to keep spreading the joy! 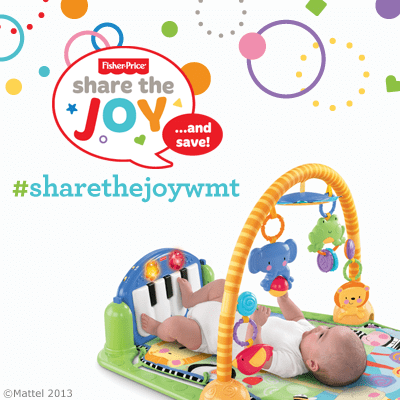 Shop the instant savings on Fisher-Price items at Walmart online and help us spread the word about sharing joy with the #sharethejoywmt hashtag! BabySavers is giving away 1 Fisher-Price Little People Happy Sounds Home Play Set and 1 Fisher-Price Discover ‘n Grow Kick & Play Piano Gym! Want to win a Fisher-Price Little People Happy Sounds Home Play Set or a Fisher-Price Discover ‘n Grow Kick & Play Piano Gym? There will be two lucky winners for this giveaway! Please use the easy giveaway form below to record your entries. The comment entry and prize choice are the only mandatory entries you must complete to be eligible to win. All others are purely optional and simply give entrants additional chances to win. My little one would be rockin on the Fisher-Price Rockin’ Tunes Giraffe! My children would have fun with the http://www.walmart.com/ip/Fisher-Price-Little-People-Fun-Sounds-Farm-Play-Set/24062802. Fisher-Price Little People Disney Princess Songs Palace Play Set is adorable!!!!! I have been eyeing the Laugh and Learn Crawl around car! My daughter is just starting to get mobile and would love this toy for the holidays! I would share the joy by giving the Fisher-Price Little People Disney Princess Songs Palace Play Set to my daughter. We would share the joy by donating to Operation Christmas Child for less fortunate children. I would share the joy with my children as I watch them happily play with the Fisher Price Little People Princess Palace. I would share the joy with child I babysit who’s mother doesn’t have much money. I would get her the the little people princess palace! I would share the joy by giving the gift I won to my friend having a baby! I like the fisher price rockin tunes giraffe and I would share it with my daughter! I absolutely love the Fisher-Price Little People Disney Princess Songs Palace Play Set…It’s my daughters first Christmas and I can’t wait!!! I started buying stuff for her in April!!! =]]] So excited!!!! My daughter loves the Little People collection. I’d share the joy with a little Princess Palace! I love the Laugh and Learn Crawl around car. http://www.walmart.com/ip/Fisher-Price-Laugh-Learn-Crawl-Around-Car/26906088. My soon to be born Grandson would get this. We’d love the Fisher-Price Laugh & Learn Puppy & Pals Learning Table, my little one has just started to stand/walk so this would may her so joyous! Thanks for the chance! I would share the joy with the Fisher-Price Laugh & Learn Crawl Around Car by gifting it to a friend’s baby for the holidays! My two year old would love the Little People Fun Sounds Farm Play set. He loves animals and their sounds. We love the Little People! If I won I would get something for my neighbors who have really fallen on hard times and I know too well how that feels. I would share the joy by getting my son the Fisher-Price Laugh & Learn Crawl Around Car. Fisher-Price Little People Fun Sounds Farm Play Set. I’d share the joy with my landlords kids’, they help us out by babysitting our little ones for us and I know their kids would enjoy it (they have twins). I’d love the Fisher-Price Little People Disney Princess Klip Klop Stable Play Set, and i’d share the joy with my friend who is pregnant, and has a 2 year old daughter! I like the fisher price laugh and learn puppy and friends table. Id keep it here at my house so all my grandkids and neices and nephews can enjoy it. I like the Fisher-Price Imaginext Rescue City Center Play Set. We take toys and things to the families at our local Ronald McDonald House year round, so this would be for them. I love the Fisher-Price Go Baby Go Poppity Pop Musical Dino! My 1st grandson is due at the end of October and I think this would be a great toy for him. It has all the things I love for babies wrapped up into one toy. With the bright colors, music, balls and multiple interaction functions, it sure to be a hit! And it’s educational to boot! I would share the joy by giving this to my grandson as one of his 1st toys from Grammie! I would choose the discover and grow kick and play piano gym for my one month old.